In a remote canyon in northwest New Mexico, thousand-year-old sandstone walls waver in the sunlight, stretching like ancient vertebrae against a turquoise sky. This storied place—Chaco Canyon—carries multiple layers of meaning for Native Americans and archaeologists, writers and tourists, explorers and artists. Here, isolation, the arid climate, and dry-laid construction have preserved ruins that are monuments to prehistoric creativity and perseverance. Chaco Canyon draws its power not only from the ancient architecture sheltering beneath its walls, but from the ever-changing light and the far-flung vistas of the Colorado Plateau. Light and shadow, stone and sky come together in the canyon. At the heart of this sky-filled landscape lie twelve massive great houses. The Chacoan landscape, with its formally constructed, carefully situated architectural features, is charged with symbolism. 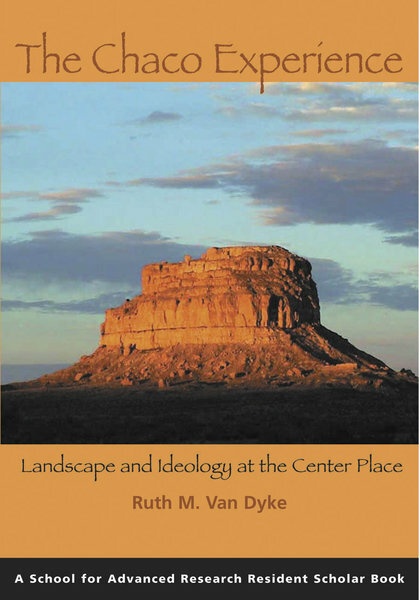 In this volume, Ruth Van Dyke analyzes the meanings and experience of moving through this landscape to illuminate Chacoan beliefs and social relationships. Besides scholarly and imaginative scrutiny and hypothesis regarding numerous artifacts and ruins of the Chaco spiritual site, the author also looks to elements of historical and present-day Pueblo mythology, belief, and spiritual practices to help her form an idea of Chaco spirituality and spiritual practices and corresponding reasons for and uses of buildings and objects of the site. Van Dyke’s study has amplitude and insight for paying attention to each particular moment and particular construction while appreciating the site as the highest, most complex expression of Chacoan culture…. “The Chaco Experience is an original and provocative study of one of America’s great enigmas. “Van Dyke selects a phenomenological approach to landscape that directs her to visibility, movement, memory and cosmology. Her field methods included walking miles of ancient Chacoan roads…. Van Dyke’s descriptions of these walks, what she noticed and felt, augmented by her color photographs, are fascinating. “Van Dyke presents abundant archaeological data and applies ethnographic information from the Puebloans’ descendants.